The new storyline We’re Out starts on Monday 22nd April. There will be new episodes every weekday (plus preview picture things on Sundays). I’m pretty excited, and a little bit frightened!! This Saturday it’s Comiket at the Platform Theatre at Central St Martins College of Art and Design in London. It’s free to get in so come and see me! I’ll be sharing a table with Timothy Winchester which is always fun, but I’m extra looking forward to it this time because he’s going to show me his 3DS-XL! Julie and Jimi dressed up as human versions of Colin and Pauline and recreated one of my comics! Haha! Thanks so much for sending it to me you guys! One of your best comics, too. I think a lot of people missed the actual joke, but the final was panel was laid out such well enough that you couldn’t be accused of having been TOO subtle. Can’t wait to see how We’re Out turns out. 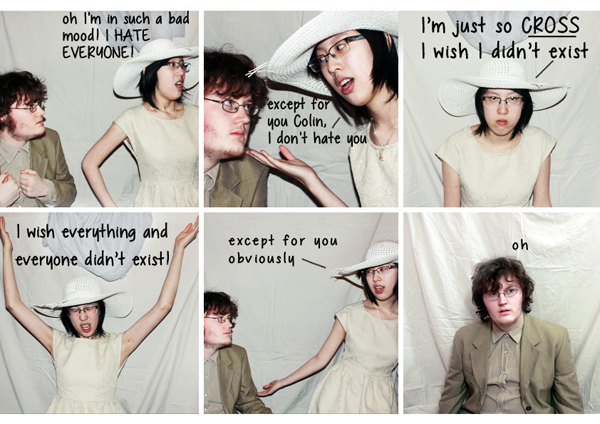 human colin’s face in the last panel is perfect! i love it!